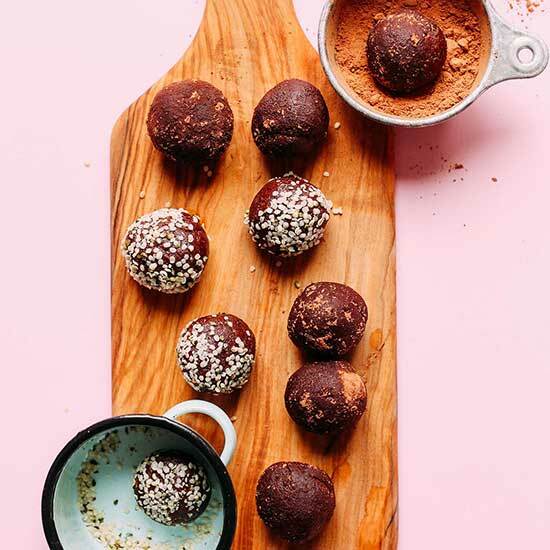 These energy bites are made with 6 simple ingredients in less than 30 minutes! Walnuts come next, which add protein and are high in omega 3 fatty acids. 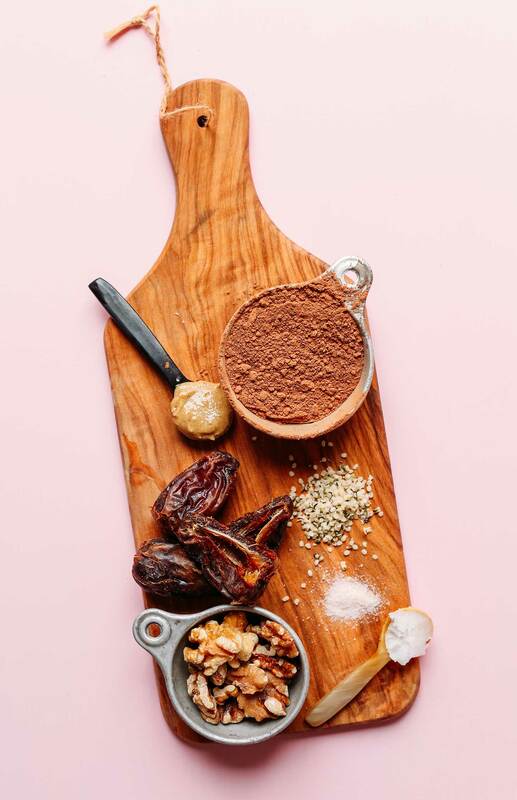 Cacao powder adds rich chocolate flavor as well as phytonutrients, magnesium, and iron. Almond butter provides even more protein as well as vitamin E, manganese, and biotin. And hemp seeds add omega-3 and omega-6 fatty acids, iron, magnesium, and zinc. Plus, they’re a perfect protein, boasting 20 amino acids, including the 9 essential amino acids. I think we can all agree that this is one healthy snack. The texture of these bites is close to a truffle! They’re so chocolaty and rich and moist. And when you roll them in cacao powder, they even get a little fudgy and sticky. I mean, this is a dreamy scenario. These bites would make the perfect snack or a healthier dessert. I love having two (or three) in the afternoon for a little energy boost alongside a cup of tea. They would also make a great topper for Overnight Oats, 5-Minute Smoothie Bowls, or Dark Chocolate Quinoa Breakfast Bowls! For more energy bites, check out our Peanut Butter & Jelly Energy Bites, Mango Energy Bites, and 5-Ingredient Peanut Butter Cup Energy Bites! If you try this recipe, let us know! Leave a comment, rate it, and tag a photo #minimalistbaker on Instagram. We love seeing your creations. Cheers, friends! *Recipe loosely adapted from my Peanut Butter Cup Energy Bites. Yum!! Super easy to make and delicious! I used 1 cup almonds, 1 cup walnuts. Turned out great! Yay! Glad to hear that, Karina! I love this balls!! They are an explosion of healthy flavor! Perfect snack when I crave something sweet! I am your fan! Love your recipes. Thank you! I forgot to rate it! 5 stars for sure! Love your website Dana! Everything I have tried has been awesome! These are my favorite energy bites! So easy and a great fix for my chocolate cravings! Thank you! Made these almost exactly as the recipe says except I only had 1 tbs of of coconut oil so added 1 tbs of ghee plus 1 tbs melted cacao butter, then used coconut shreds to roll them in. So not really “almost exactly” at all but they are fantastic! I’m on a Whole30 diet right now and these are a great grab-n-go breakfast. Oh my goodness thank you SO MUCH for this recipe! 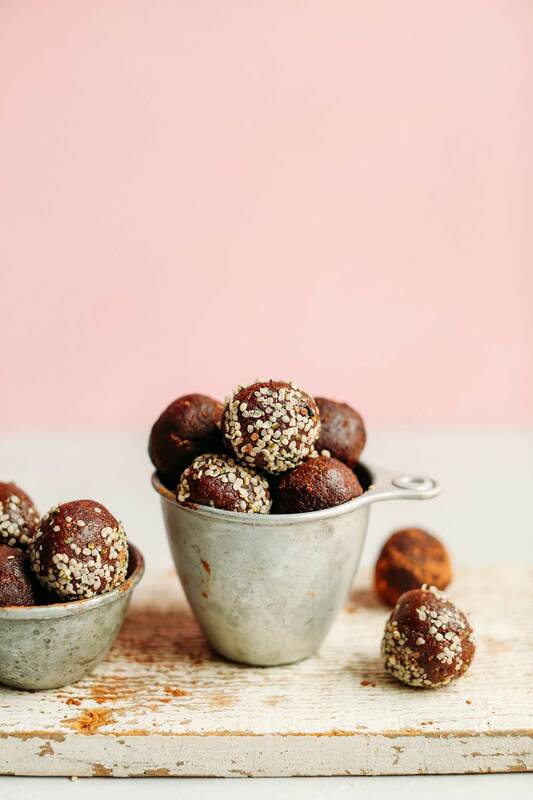 When I was travelling in New Zealand I found these delicious energy bites, can’t buy them anywhere else in the world and I was desperately looking for a similar recipe to make them myself – and I have finally found it! Your recipe is perfect! To make them just like the ones I had in NZ, I swapped the walnuts for hazelnuts and used peanut butter instead of almond butter. And I didn’t use hemp seeds, but shaved coconut for the coating. It was seriously amazing. And I love that you include metric measures in your recipes. I will keep this recipe for the rest of my life! Thank you! Oh my gosh, Dana, these were AMAZING!! We make a lot of energy balls around here and these are quite possibly the best I’ve ever made. So good!!! Just made these and they are really delicious! I wanted to forgo the blending the dates separately, but I’m glad I followed directions, super smooth and fudgy texture! I’ve been using your recipes all year long and really love the simplicity of them and how healthy they are. Thank you! Today I made these and the “meat”balls. I really like both. We have the same taste and I’m so happy to have found your site. Looking forward to making more of your recipes. Just wondering if anyone knows how these hold up in the heat of a hot Summer day in Australia!? They’ll hold up for a while but I’d pop them in the refrigerator long-term! Absolutely incredible! So easy and so delicious! I have made these a few times now and they are so easily adjustable. This last time I made them I didn’t use any coconut oil but instead used a little more of the nut oil which this time was a mixture of cashew butter and sunflower seed butters. Then rolled them in crumbled toasted almonds since I just love that taste. I also added a little bit of ground flax seed to the whole mixture. The salt is essential. Thank you Dana et al, this recipe is brilliant! Whoop! We are so glad to hear that, Sarval! Hi. What other nut besides Walnuts can I use? I’m not a Walnut fan. Would this work if I just used a nut butter instead if walnuts? I was recently diagnosed with several food sensitivities and walnuts, almonds and cacao are among them! I had to try your recipe and improvised: carob powder for cacao, pecans and cashews for walnuts and cashew butter for almond butter. Turned out super yummy and I can only imagine how delicious they are with the original ingredients! This recipe will become a staple! Thank you! ? Great recipe! The dates were a bit annoying to get chopped up but eventually it turned into a ball in the processor like you said. I added a bit of vanilla to the mix and at the end I mixed in gluten free rolled oats by hand. Turned out wonderful! Thanks so much for the recipe ? What a delicious little treat! Rich enough to satisfy my sweet tooth, but I feel good eating them for a healthy afternoon snack. I subbed chia seeds for the hemp seeds and peanut butter for almond butter, then rolled them in cacao powder and coconut. Will be doubling the recipe next time for sure! Messy to make and eat but OH SO DELICIOUS! Totally satisfies my craving for a fudgy brownie but way healthier. I don’t bother with the coconut oil and I roll them in cocoa powder. Amazing. And yes, the dough will seem very crumbly at first, but I just press it together with my hands and the balls form easily. These are just amazing…fudgy, sweet and a bit salty. Perfect! These are delicious!! These taste just like a truffle and are so satisfying. What can i use instead of the dates and how much quantity? Dates are kind of expensive for me. What would be the next best choice? Hi Julie! You could try prunes or figs! Hello! My mixture is very crumbly, it won’t roll into balls…not sure if I need to add more cacao powder or does the mixture need to be wetter? I’ve made these 3 times now and actually have 100 sitting in my freezer. Confession, I dipped them in dark semisweet chocolate – they are awesome! 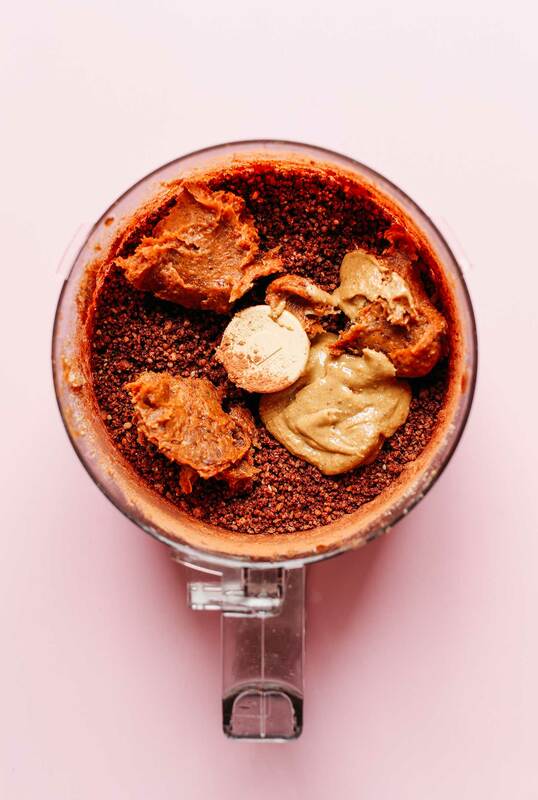 I don’t have a food processor, can a blender work? Hi! You can give it a try, but I think it’ll be too dense for the blender to properly chop! Hello! I’m wondering if you had any luck with using a blender? Could I sub figs (dried similar to dates) in for the dates? looks good! Hi Brooke! I think that would work! We made these and the pbj bites tonight. They passed the kid and parent test! I used cashew butter because I didn’t have almond. Excellent!!! Thank you. Good to know! I also have cashew butter on hand (out of almond) so glad they are delish with that sub! These are better than any chocolate bar!!!! I used peanut butter (unsweetened) and a toouuuch of honey and let me tell you…they are to die for! Love your blog so much. 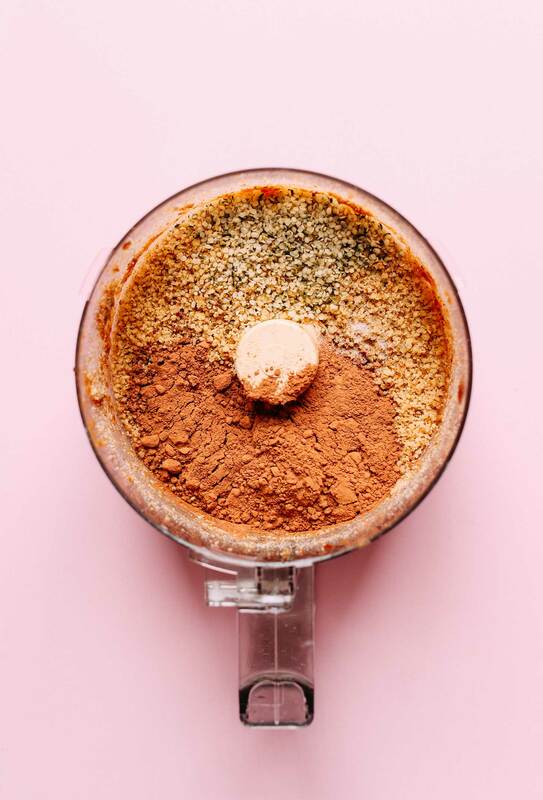 I know in many recipes you call for cacao powder, or sub unsweetened cocoa powder but wondering what the difference is? I’ve asked at the health food store I go to and they told me its the same thing just different pronunciations? Hi Gabby! Give this a read! I am definitely going to try these but I have a question. I sometimes soak my nuts to counteract the phytic acid in them. Do you think this would be detrimental to the texture of the bites? I’ve never made energy bites before at all so I have no frame of reference. I’m sorry, but… How much of cacao powder? 1/3 cup + 1tbsp (38g)? I’m confused… :)! Just a little more than 1/3 cup, Mafalda! (Thus the + 1tbsp) Hope this helps! It does! Thanks! Love the recipes of this blog! I’ve made this bites yesterday, they are lovely! So soft! Hi5, Dana! Cheers from Portugal! I initially only made half the recipe in case I didn’t like how these turned out but man am I regretting that now. These are absolutely delicious. They aren’t too sweet and they are so super simple to make. They taste amazing out of the freezer too. Will have to make more this week. Thanks Dana! Would using sesame seeds work to roll in? Or coconuts? PS the vanilla ice cream recipe is working overtime ha ha. I shape into lollipops and cover with dark chocolate. Awesome just like we buy but nothing on me conscience. Hi Joe! Both sound delicious! Do you know what the smart points might be for one of these? Delicious. I recently did a week of field work in the Arctic, where temperatures were subzero every day. I made these energy bites to snack on while in the field, and I couldn’t be happier that I did! They were quick and easy to eat on the go, and full of healthy fats and carbs to keep me energized throughout the long days. I made these tonight. They were so good and turned out great. I rolled some of them in the hemp seeds, some of them in cacao powder, and the rest if cacao nibs. I’d love to say that I’ve made this recipe twice, but I’ve used the base of this recipe and what I had on hand to make these twice. Both times they turned out great. The first time I used chia seeds instead of hemp, pecans instead of walnuts and peanut butter instead of almond butter. The second I used a nut mix because I forgot to buy nuts at Trader Joes despite intending to make these. Whomp whomp! Delish! Made these with 1 cup walnuts and 1 cup pumpkin seeds, added a couple of tablespoons of macaroni powder. I just love the versatility of this recipe not to mention how delicious these turned out. And so easy. I’m a big fan. Heading over to install to post pictures now! Love these!! Do you archive your Insta stories somewhere I can watch? I remember you saying you recommend certain dates… my consistency didn’t seem the exact same as your video as I remember it. Hi Rachel! We don’t currently do that, but it is a great idea for future. We typically use medjool dates! Ah yes mine are medjool but looked a lot different than your video. Did you say you got yours at Trader Joe’s? These are the most delicious things! This is the first time I have had dates in anything (other than Larabars, which I love) and I quite like them as a dessert alternative, even though they are still loaded with sugar. This recipe was really fantastic. I used peanut butter and I love the mixture of flavours and textures- sweet, salt, crunchy, mushy, peanut-buttery, chocolatey. I did more coated with hemp seeds than cacao powder because I found it easier to control how much coating I was adding. I look forward to trying variations, like with chia seeds or shredded coconut (which I’ll love, I’m sure). I made these today after watching you make them on InstaStories originally. These were perfectly easy and super delicious. Thank you so much! I definitely want to try this one! I’ve had a ginormous bag of raw cacao in my pantry for a couple of months now with no idea what to make with is (besides yummy almond milk hot chocolate, refined sugar free of course). I also love more uses for hemp seeds besides just topping oatmeal or yogurt with them! This is the first time I have made an energy ball, and these turned out great! My husband likes them too. A treat without feeling too guilty ;) Thanks for the recipe! These are so delicious! They don’t taste healthy at all! They 100% satisfy my sweets cravings! Dana, these rocked my socks off! 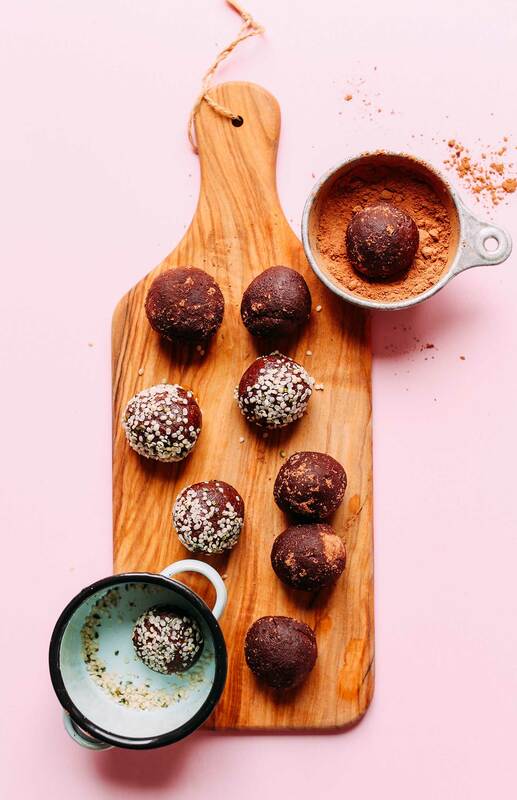 I made a recipe for energy bites from another site a couple of weeks ago and they were nothing compared to these… these are SO good! Okay…..so seriously, this are amazing. I’ve made them twice now. I made the first batch with chocolate chips since I was out of cocoa powder. I also used 1 cup of almonds and 1 cup of pecans because my walnuts went bad. The second batch I used cocoa powder and almonds/pecans. They are AMAZING. SO DELICIOUS. I’ve been taking them to school with me, and they are a great source of protein and healthy fats. They are a great way to get the omega-3’s in with the hemp seeds, and I love that they are only sweetened with dates! Such a mild sweetness, and soooo delicious! My kids loved them too! Also, thank you so much for everything you do. I love food and I love healthy eating (I’m studying to be a Dietitian) so it’s a great resource for me to be able to make your recipes knowing that you put thoughtfulness into the ingredients, and have such a focus on plant-based foods! I made it and loved it! Thank you for the recipe. Love your blog so much. These are sooo goood! Thanks for the recipe it’s a keeper!!! Also – who knew what hemp seeds were, or what they tasted like! Delicious!! I made this yesterday! They are really delicious, and filling – a great quick meal replacement. They didn’t come out as sweet as I was hoping, (I might have added more unsweetened chocolate than what was called for :) so I added some stevia after, by hand. Next time I think I’ll add it (or maybe agave or maple syrup) to the nut mixture before adding back the wetter ingredients. But they’re REALLY great! Thank you! I made these this past weekend to have on hand for snacks this week, and they really hit the spot! Love the fudgey taste and how simple they are to make. What a great recipe! Just made it and thinking I might make them once a week! Thank you Dana, for yet another great recipe! I am currently working my way through your catalog. I am totally hooked on your recipes! I love that I usually have all of the ingredients in my pantry and can make them as soon as I see one that is calling my name. I was low on dates so I had to wait until I went to the store until I made these, but I finally did today and O.M.G. These are incredible and very hard to believe there is no added sugar in these. Thank you for your hard work… my family and I really appreciate it! These energy bites are so good and i love the texture, thanks for this simple recipe. I didn’t use butter, because i forgot to add it, they turned out great anyway! And i found your other energy bite recipes, i’m on it! I’m loving all the comments and suggestions. It all sounds yummy. Did I miss the response on what food processor you use? I had a fabulous chopper for 20 years. Like Humpty Dumpty, it had a great fall and we could not put it together again. Please say what food processor you use. Thank you! Hi! You can find the one I use here. I didn’t have hemp seeds anymore so I used flax seeds. I also didn’t have enough walnuts so i did half walnuts and half almonds. And in the end i coated the balls in coconut flakes. Delicious base recipe though, thank you!! Wow… again, these are awesome. Couldn’t stop eating them. Love it! Thanks Dana, I love your recepies. Can’t wait to try new ones. Made these yesterday and they are delicious! Kind of remind me of a fudge brownie. Since my dad has a liver disease, he has been craving sweets more frequently. I’ve been looking for a healthier version of some sweet items that are nutritious and I think these are it! Thank you for all of your wonderful recipes. These look like fudgey, chocolatey heaven!! Oh my lawwwd!! Love that you used walnuts!! Do you know of a substitution for the dates other than dried fruit? Vegan, gf, and sugar free please. What about other nut butters? I made these with TJ’s new mixed nut butter. Warning: these are good!! And really hit the spot for my chocolate/sugar cravings. Thanks for sharing! Thanks for this awesome recipe! I was out of almond butter so I added peanut butter instead. Turn out great! I made these with half walnuts and half pecans and rolled them in hemp seeds. They’re so yummy! I may try them with peanut butter in place of the almond butter next time so they taste like peanut butter cups. LOVE your recipes. I made the almond chocolate chip (V, GF) cookies on Sunday. So good! I made these today and can’t stop eating them! I rolled them in cacao nibs after the cacao powder and hemp seeds, Yum! What an amazing recipe! I made these tonight but I’m not a fan of hemp seed so I substituted 1.5 tbsp of ground sunflower and 1.5 tbsp of ground sesame seed into the mixture. Once formed I rolled them in the cacao powder then unsweetened coconut! They are now called amaze-balls in my house. These are absolutely delicious and a perfect sweet tooth grab when the craving comes on. Thanks! We subbed pecans and peanut butter because we had them on hand. So yummy & fudgey and totally satisfied my chocolate craving! Thanks so much for the fabulous recipe. Hi Dana I was so excited when I saw this recipe that I made them right away. I did add the coconut oil and I used crunchy almond butter instead. Unfortunately they arent sticking together at all so I tried to press it into a 8×8 pan and make squares after they sat in the fridge overnight but no luck. Add more almond butter? Or maybe the dates weren’t blended enough? My food processor is really old too. Spoonfuls of the “dough” are delicious though. Hmm, sounds like maybe the dates weren’t fresh enough OR they weren’t blended finely enough! Add more dates or almond butter next time! I made these this afternoon for our Mardi Gras dessert and an event I’m hosting this weekend. My son has a nut allergy so I replace all nuts with sunflower seed and sunbutter. It was good but to me it was too much sunflower. My second batch I made with pumpkin seeds and sunbutter instead, SO MUCH BETTER! Didn’t over power the cacao powder like the sunflower seeds did. I’m allergic to nuts as well and was looking for a substitute. Thank you for posting! Did you use the same measurements as the original recipe? Yes I did. Wonderful “dessert” that everyone loved. Just made these, they are perfec, all chocolatey and almond-buttery, if that’s a thingt! They go well with the afternoon coffee, and satisfy my sweet tooth! I just recently discovered hemp seeds and love how they add some bite. Thanks for another tempting recipe. Can I use hemp protein powder instead of hemp hearts? Would 28g or so be enough? Will this change the recipe in any way? That should work! Try that amount and add more as you need it. I can’t eat walnuts so I’m going to try pecans or macs. I thought i I had all of the ingredients to make this. Turns out I did not have dates. Or almond butter. So I tried it with molasses and peanut butter. Still turned out delicious, although as the mixture was more wet it absorbed the cocoa powder coating instead of acting as a sticky barrier. Great base recipe! Making tomorrow. I’m so impressed that you have replied to all the questions . Awesome :) Will let you know how mine turn out..
Can’t wait to try this recipe… looks delish as usual! Could I add a scoop of protein powder into these bad boys or do you think it will become to dry in that case? Hi! Protein powder would be a great addition! If you find that your dough is dry due to the addition, add more almond butter! These look great! As a college student pursuing baking, delicious healthy recipes are what I look for! Love what you do and your entire purpose, keep it up, we need more people like you. Can’t wait to try these over spring break! I saw your video on instastories and had to try them. 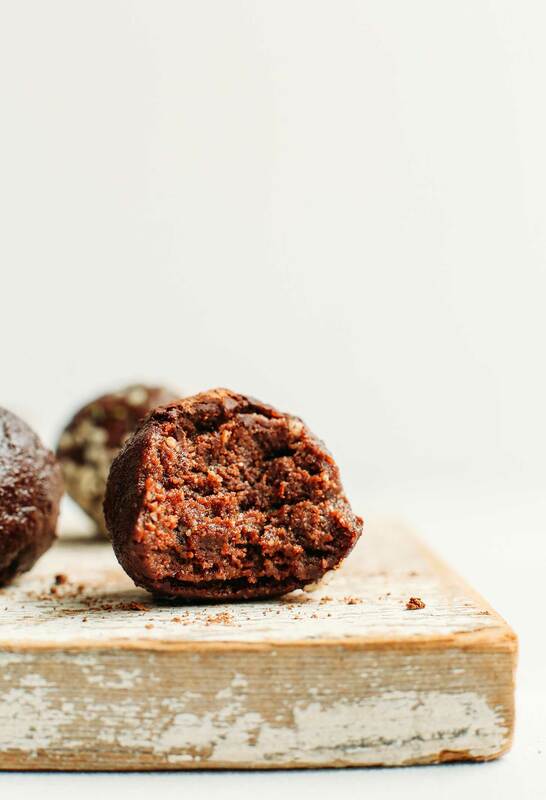 I have tried other date balls, but these are amazing! They will definitely hit the spot when I get a chocolate craving, they taste super rich and delicious. What nuts would you sub with the almonds? I’m allergic. Cashews maybe? Pecans? I think either would work! Let me know how it goes! I used a combination of nuts: some macadamia nuts, hazelnuts, and pecans. It’s what I had on hand. Turned out just fine. Love this recipe! Your Vitamix should work! You may have to give it a couple stirs to make sure it mixes throughout though! I actually had a hard time with my vitamix dry container- had to finish mixing by hand. What type of food processor do you use? I need something that can handle these yummy energy bites! Hi Nicolle! This is my food processor. Good luck! These look delicious and your photos are stunning! What is the purpose of the hemp seeds? I have never used them and wonder what could take their place. Where do you find them? Hi Lenore! Hemp seeds are a great protein source and healthy fats! You can find them in most grocery stores! Flax seeds may be a good replacement but I haven’t tested! I have hemp hearts. Would those work for the seeds? I’m new. LOL And I’m going to try cashews instead of walnuts because my husband is allergic to tree nuts. I can’t wait to try it. Yumm these sounds delicious i will be making them with my sukkari dates they are sweet like caramels ? But i have small question can i know the brand of your food processor? She has the food processor that she uses in her “shop” section on the site. It’s CuisinArt if I do recall correctly. Could I use chia seeds instead of hemp? Don’t have them on hand right now! Its worth a try! Let me know how it goes! These are great- so fudgy. I also added a tablespoon of chia seeds and a tablespoon of wheatgrass powder. These look delicious!! Will make them this week. Thank you for adding the weight of ingredients. Very helpful! I’m allergic to Almonds. Can I use sunflower seed butter? And just curious why the walnuts aren’t toasted. Has anyone tried this with toasted walnuts? It’s easier! But toasted would be awesome, too. These look like hemp hearts as opposed to hemp seeds – would you please clarify for me, thanks! !